Are you tired of reading about the many things you can do with apples yet? 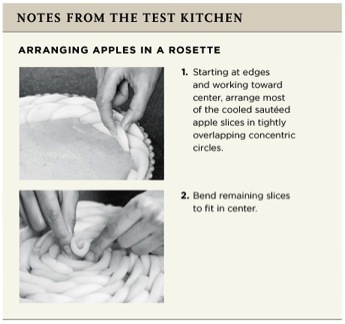 Hope not, because here's some great information from the pros at America's Test Kitchen on how to make a classically elegant apple tart, simplified and foolproofed. We had a similar dish for dessert once upon a time when dining out to celebrate our anniversary, and I was completely enchanted with how beautiful and delicious it was. The following week after our celebration dinner, I started researching and attempting to make my own version, without a lot of luck. I came up with something that tasted good, but it wasn't all that pretty. And a real frustration was how it sliced when I was serving it. Everything sort of crumbled away. Not a big deal if all you care about is taste, but the die-hard foodie in me wants more than great taste-I want a lovely presentation, as well. 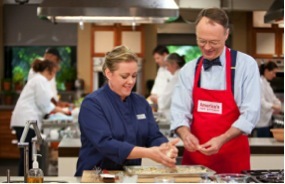 Thank goodness for America's Test Kitchen. They care about presentation also, so how to ensure success in that area is always part of their experimentation. They found the secret to an apple tart that met all my criteria. So if you're interested in how to make a French apple tart worthy of the finest Parisian patisserie, read on. The Test Kitchen team figured out a simple way to make this elegant beauty in a way that also ensures it slices neatly. It is nothing more than peeled and sliced apples arranged artistically in a pie shell. The good news? The issue isn't in the crust recipe-use your favorite-the issue is in technique. Thus you want to model theirs. First they say a crisp, sturdy crust that will bake up with a fine, compact crumb that resists turning soggy, is crucial. To achieve that, you will want to use a melted fat rather than a cold fat (they used butter), in your pie crust recipe. Next, the Test Kitchen pros suggest parcooking the sliced apples in a skillet for just a few minutes-about 5. (I plan to parcook mine in apple cider to add a little extra flavor.) This makes the apples pliable enough to bend into place, which especially matters as you get further into the center of the pie. You'll notice in the pictures that they started at the outside of the tart and worked their way into the center. Lastly, these experts say to pour a warmed concentrated puree of apricot preserves over all the slices. This touch adds pectin, which firms up the filling-one of the secrets to the tart slicing nicely. They also suggest brushing the tops of the apples thoroughly with the preserves, which will add an extra burst of flavor and a glossy sheen. While I admit this dessert may take some extra time (peeling, slicing, parcooking, and the tedious arranging of the apple slices), I love how all it basically contains is a nice crust, apples, and some apricot preserves. Pretty easy, really. I'm thinking a French apple tart would make a terrific substitution to my proverbial apple pie that always shows up at our fall and winter dinners. And if I can get it perfected between now and Thanksgiving, this lovely treat may just top off our meal!